March 20, 2011 January 16, 2018 P.O.P. Earthquake. Tsunami. Radiation. Japan was certainly struck with its share of disasters this month. And as a result, the U.S. was struck by a huge wave of hot air. Not produced by nature or technology, but by the media, as the pro-nuke punditocracy raced to assure us that things like this don’t really happen, and even if they do there’s no sense in getting alarmed because there’s no way radiation would harm the Japanese people (since that’s never happened before), and even if it does it couldn’t happen here, so we should forget the dangers and go full speed ahead with nuclear plants, just because, and if you question that then you must be tree-hugging librul moonbeam jockey or something. Even though I was all too aware that the opinions of RRR’s are infallible even when they’re secondhand, I felt compelled to point out a couple of key differences here. First, earthquakes and tsunamis are more or less instantaneous; and in this case they’re already past tense and we’re just dealing with the aftermath. Radiation, on the other hand, may not makes its effects known for years, even decades. (Care to ask the Japanese about this?) To say that the radiation hasn’t killed anyone is to make an extremely premature call. Second, nobody knows how to prevent an earthquake or tsunami. 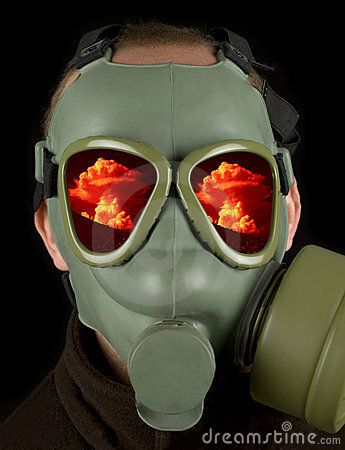 Nuclear disasters, on the other hand, are one hundred percent preventable. The question of whether they should be prevented with certainty (by eliminating nuclear power)- in other words, the question of how the risks stack up against the benefits, is open to debate. But the very existence of risk itself is not. Everybody knows it’s real. Well, everybody except this person maybe. Even the interviewer, fellow Fox funhouse fanatic Bill O’Reilly, is taken aback by this one. With the exception, however, of this one sad individual who clearly is making yet another desperate attempt to draw attention to herself, we all are more or less aware of the danger. We just prefer to look the other way. Because that’s what the punditocracy says we should do.